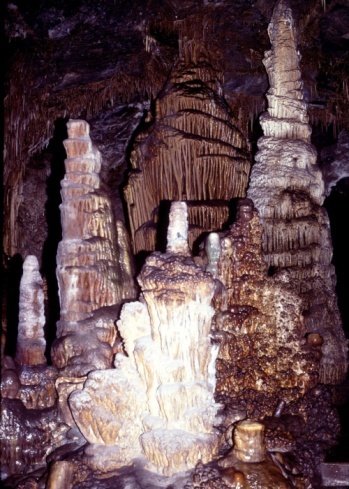 Limestone creates beautiful stalagmites in a cave environment. Exam the stone visually. Sandstone is created in layers. If you can see horizontal lines through the stone indicating these layers, you can be sure that it is sandstone and not limestone. Limestone is made mostly of calcium deposits from large collections of shell, bone and coral and creates a solid colored stone. Exam the color of the stone. Because sandstone is made up of many types of rock and sand, its coloring can be blue, red, brown or even green. Limestone however is always white due to its calcium makeup. What Type of Rock Is Bluestone?